Monarch Air Group provides private air charter in Birmingham, AL. Our clients benefit from top-notch service, unrelenting dedication to safety, wide selection of aircraft, and years of experience in chartering private jets. To obtain a free quote, please use our online quoting tool provided below, or call toll free 1-877-281-3051. Monarch Air Group provides private jet charter flights in and out of Birmingham, Alabama, USA. Birmingham is the biggest city in the state of Alabama. 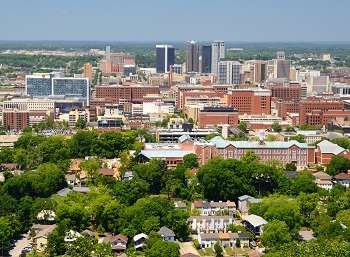 Often named as “The Magic City” by its state residents, Birmingham has real southern hospitality and charm. It is located in the rolling base of the Appalachian Mountains, which play an important role in the metal industry. Due to its low income cost and competitive salary wages, nowadays Birmingham is considered to be the best city to live. It also provides residence to over a million people. The popular tourist destinations are Alabama Sports Hall of Fame, the Version Wireless Music Center, and the Red Mountain Vulcan Park that has the world’s biggest statue made of cast iron created in 1938, for 1904 St.Louis explosion. 1. ALX, Thomas C Russell Fld, Alexander City, United States. 2. ANB, Anniston Metropolitan, Anniston, United States. 3. ASN, Talladega, Talladega, United States. 4. GAD, Municipal, Gadsden, United States. 5. PLR, St Clair County, Pell City, United States. 6. TCL, Van De Graaf, Tuscaloosa, United States. 1. Hotel Highland At Five Points, 1023 20th Street South, Birmingham. 2. Tutwiler Hotel, 2021 Park Pl, Birmingham. 3. The Redmont Hotel, 2101 5th Avenue North, Birmingham. 4. Doubletree Hotel Birmingham, 808 20th St S, Birmingham. 5. Hotel Highland At Five Points, 1023 20th Street South, Birmingham. 6. Holiday Inn Birmingham, 5000 Richard Arrington Junior Boulevard North, Birmingham. 7. Hampton Inn-Mountain Brook, 2800 U.S. 280, Birmingham. 8. Tutwiler Hotel, 2021 Park Pl, Birmingham. 9. The Redmont Hotel, 2101 5th Avenue North, Birmingham. 10. The Redmont Hotel, 2101 5th Avenue North, Birmingham.